U.S. National Cathedral to Host First Muslim Prayer Service | Have Ye Not Read? Listen, I respect all religions. Everyone has a right to believe what they want, and basically worship how they want. But I’m a Christian, and I’m quite aware of what the Christian Scriptures say about mixing religions, or even having spiritual fellowship with other religions. What they are fostering, instead — in the name of cheap “understanding and acceptance” — is animosity between God and His Christian people. Do not be deceived — that is the actual goal. And they are quite aware of what they’re doing. The powers that be are basically attempting to rob our Christian people of their inheritance in Christ. Quite simply put, we’re not to use the National Cathedral to promote the policies, beliefs, prayers or heresies of other religions. “For thou shalt worship no other god: for the LORD, whose name is Jealous, is a jealous God: Lest thou make a covenant with the inhabitants of the land, and they go a whoring after their gods, and do sacrifice unto their gods, and one call thee, and thou eat of his sacrifice;” (Exodus 34:14-15). 1Co 16:22 If any man love not the Lord Jesus Christ, let him be Anathema Maranatha. The term “Anathema Maranatha” means “accursed to the time of divine judgment.” In other words, if they reject Christ Jesus as the one and only Lord and Savior, we’re to consider them enemies of the cross of Christ. Call me dogmatic if you want. But to me, that most certainly doesn’t sound like an invitation for heathen religions to come hold prayer services to their “gods” in our National Cathedral. I pray for all men’s salvation. And I’ll earnestly and without malice sit down and discuss Christ with any man or woman of any religion who sincerely wants to know more. 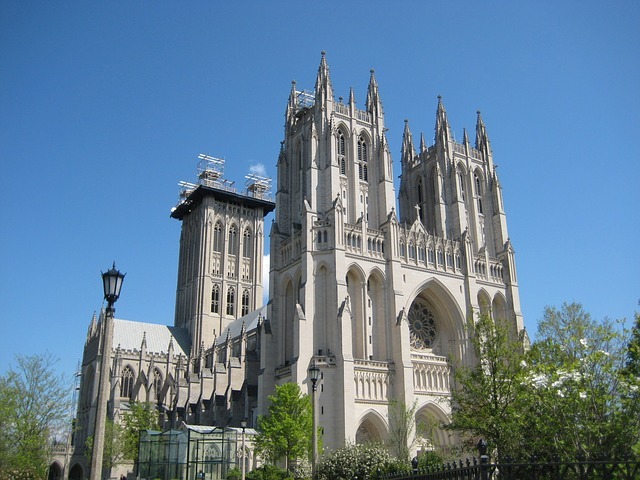 But to so thoroughly compromise with the enemies of Christ by giving our National Cathedral over to them so they can hold prayer services to their “gods” is simply unacceptable. This is what cost king Solomon the united kingdom of Israel, in his old age. To do so under the guise of “fostering understanding and acceptance” is just plain stupidity. It means we haven’t learned a thing about how the enemy works. If they want to pray in our churches, then let them become Christians. They’re not to be allowed to pray to their “gods” in our churches — and most certainly not in our National Cathedral. The only reason this nation is still standing is because of the mercy and grace of our Lord and Savior Jesus Christ. One way to lose that mercy and grace is to turn our backs on His very clear Word on this matter, and on His feelings, as well, by embracing an empty “understanding” between Christianity and false religions.